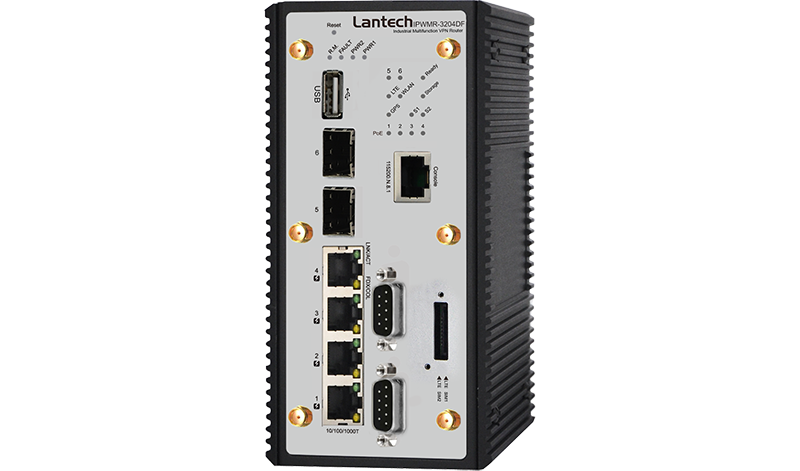 Lantech IPWMR-3204DF series is a next generation industrial multi-function VPN router w/up to 2x 802.3ac WiFi + up to 2x LTE modem + 4 GigaT + 2 Dual Speed SFP incl. 4 PoE ports + 2 serial ports that supports advanced function of VPN, Load-balancing**(Basic & Full package), EMMC Flash Storage**, TWCC**, Protocol gateway(Modbus), WiFi roaming** and LTE quad SIM fail-over for industrial applications. The dual core CPU with 1.6GHz + 256M flash enables the router to multi-task smoothly. IPWMR-3204DF supports series supports optional TWCC** (Train Wireless Carriage Coupling) that enables auto wireless coupling to reconnect APs. With dual LTE module design (2L model), 4 SIM card slots, IPWMR-3204DF can allow auto-swap, failover & failback between multiple service providers for real non-stop connection. With concurrent LTE modules, it can also allocate bandwidth by Load Balancing** with 8 schemes between multiple WANs. With one mobile LTE module (1L model), 2 SIM card slots, IPWMR-3204DF provides redundant link between two service providers. Both GPS and Russian GLONASS systems are supported. With IEEE 802.11ac capability, IPWMR-3204DF can operate either 5GHz or 2.4GHz bands, offering the maximum speed of 2.6Gbps bandwidth (1.3Gbps per 1AC). It is also compatible with 802.11g/n that can work with 2.4GHz for longer range transmission. The WiFi 11ac supports AP/BRIDGE/AP Client modes can be diverse for most of wireless application. Working with load-balancing** “Priority” mode, the AP client can enable router to transmit on WiFi with first priority. Lantech IPWMR-3204DF series adapts MIMO technology with smart antenna transmission and reception for 3T3R. With six external detachable omni connectors and optional antennas, IPWMR-3204DF can have better Wi-Fi & LTE/GPS coverage. IPWMR-3204DF support fast roaming ** (optional) in coordination with Lantech Wireless Controller to allow encryption keys to be stored on all of the APs in a network. Client mode supports PMK** Caching and pre-authentication. The security support standards including 64/128bits WEP, WPA/WPA2 PSK (TKIP*, AES), 802.1x** ensures the best security and active defense against security treads. Lantech IPWMR-3204DF support up to 16 SSIDs, each SSID has its independent security and encryption. It builds in 2 port serial connection for RS232, RS422, 485 in which RS422/485 has 2.5KV isolation protection. The built-in Modbus gateway can convert Modbus RTU/ASCII to Modbus TCP for device control. Besides traditional VPN peer to peer tunneling, IPWMR-3204DF support latest Multi-Site VPN function that is an efficient way for mesh tunneling. The registration is under cloud service and encrypted by SSH makes the connection easy and safe. It supports Multi-Site VPN, Open VPN, L2TP, IPsec L2 over GRE, and PPTP** for various VPN applications. The built-in Layer-4 firewall includes DoS**, IP address filter / Mac address filter* / TCP/UDP port number. 2 sets of DIDO function can support additional high/low physical contact for designate applications besides Port / Power events, for example, DIDO function can trigger alarm if the router was moved or stolen. In case of events, the IPWMR-3204DF will immediately send email** and trap. When the router is at remote area with limited access, Web/SMS** control can help to get router status or remotely reboot by Web/SMS**. The IPWMR-3204DF is able to work from 9VDC to 60VDC (24V model) for PoE at/af with PoE budget 80W that is particular good for vehicle, rail train, depot etc. application. Managed switch function is built-in and provides various L2+ functions for network access deployment. It delivers port management, VLAN, QoS, multicast, redundant ring and security functions. The built-in USB port can upload/download the configuration through USB dongle for router replacement It supports dual-image firmware* to choose which one to start. The IPWMR-3204DF supports editable captive portal function that allows administrator to force end-users redirect to authentication page.